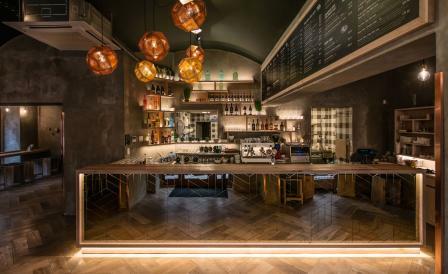 Prague’s Thai restaurant group, Modrý Zub, has just launched its third outpost, this time located in Smíchov, the shopping, media and business district of the Czech capital. Aiming for a distinctive Thai urban jungle aesthetic, architect Kryštof Blažek of local firm Minio Studio, clad the walls in bleached oak panelling embellished with bold Thai words. In contrast, a polished mirror bar reflects the entrance to the restaurant, while pendant lamps by Tom Dixon and chairs from Hay create a slick sense of design. Like its sister restaurants, food does not disappoint; we suggest starting with Naema Rum Khuan rolls with smoked salmon and fresh dill sauce, followed by the succulent wild boar, braised with red curry paste and coconut milk and served with fresh vegetables.